If you delve into the history of Kay Bojesen you see right away that the world-famous designer and functionalist was not only a vibrant bundle of energy and an overgrown kid at heart, but also a man of the future. As a designer, Kay Bojesen advocated modern educational theory and production methods and, like many others, he was captivated by the progress of mechanical engineering and technology, which sent more and more cars onto the streets, and with their speed and beautiful shapes. Kay Bojesen never learnt to drive himself, but that didn’t stop him benefiting from the joys of car travel, partly on his frequent taxi rides from his home in Skodsborg to the shop on Bredgade – and, of course when he designed his own vehicles, with the 1937 Sedan car as one of the best-known. It is now being relaunched for the benefit of all speed-loving design fans. Several have commented that the secret behind the success of Kay Bojesen’s wooden figures was that he never forgot what it is like to be a child. 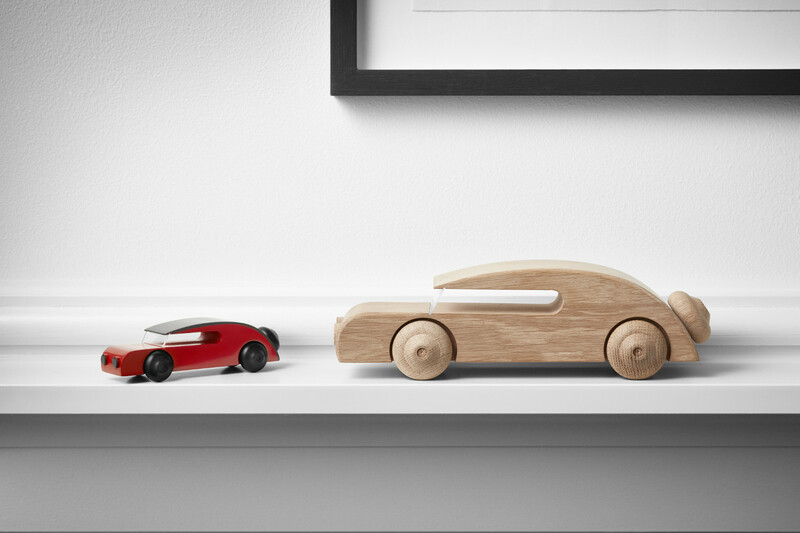 A look at this autumn’s two new products – the big Sedan car made of natural wood, and the small, bright red-and-black painted one – reveals there is some truth in it. 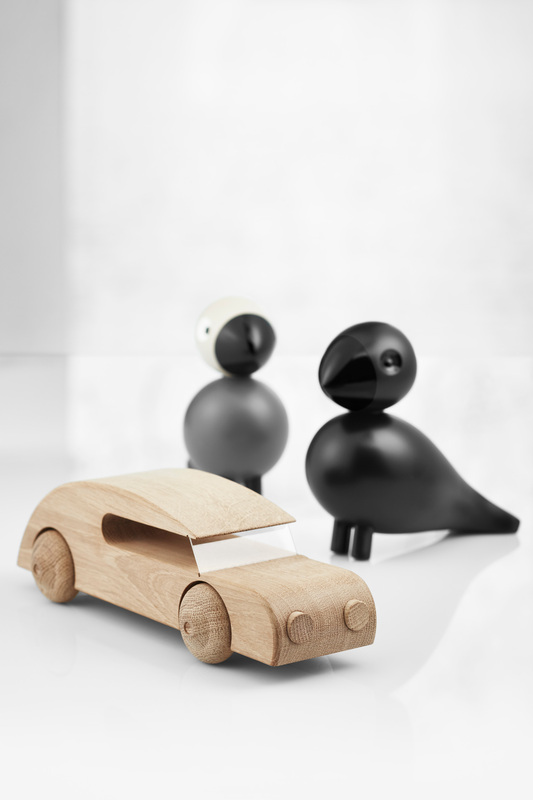 Even though these superbly crafted cars are not intended to be replicas of real cars, just like Kay Bojesen’s famous chunky hardwood animals, there is a life-like smoothness to their design, feeding the imagination and giving the soft, aerodynamic lines a dynamic look, so you can virtually visualise them motoring along. 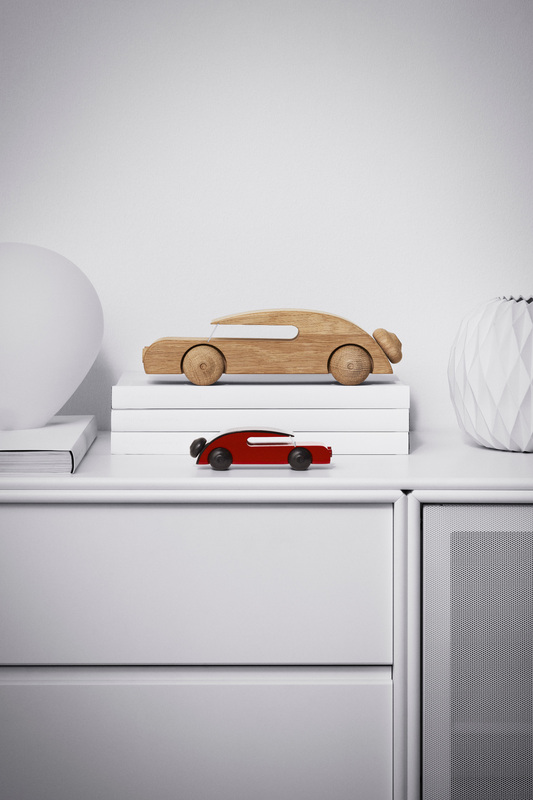 Kay Bojesen created the sophisticated yet accessible car design especially for slightly older children who had grown out of clumsy designs on wide wheels and instead craved engine power worthy of a true superhero. Today, however, Kay Bojesen’s designs have long since moved out of the realm of toys and into the world of designer gadgets, where both the large natural wood car and the smaller painted Sedan stand to become cult collectors’ items for anyone who wants to liven up their home with a few select accessories. 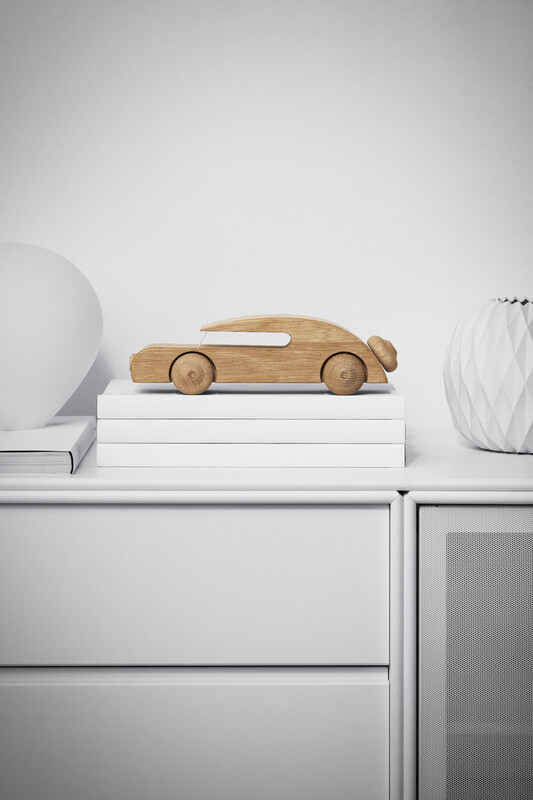 Here, the wooden figures bring warmth and atmosphere to your desk, a men’s lounge, teenage room or hall table, where a still life of coffee table books, wooden cars and a cool ceramic bowl for household keys set the scene for the simple Nordic Living style.